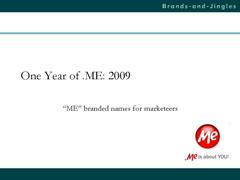 Press-release: One Year of .ME: 2009 – white paper “ME” branded names for marketeers – Marketing, of course! To celebrate one year of official live launch of .me domains, Brands-and-Jingles has issued a white paper on how “me”-branded names are used in marketing. In its effort the advertising agency wants to congratulate .me registry team, registrars, the developers and Internet users with another important milestone of jingling online marketing and wish the one year old baby many happy returns. The document summarises the first year of .me as well as provides exhaustive overview of “me” advertising with numerous examples. “In less than a year .ME became more popular than .asia, .jobs, .coop, .aero, .int, .mil, .museum, .name, .pro, .tel, .travel, and other 200 country code top-level domains” – notes the document. Word “me” can be found on every fourth web page. It is used by thousand of companies for their brands and marketing campaigns to steer the consumers into buying their products. Apple’s “Mobile Me”, Microsoft’s “It all about me”, famous British “Model.Me” beauty brand, “23andMe” developed by Anne Wojcicki, the wife of Sergey Brin, – the list is practically endless. Not only .me web sites are novel and easy to remember, they also attract many online customers: notify.me – helps its users managing real-time updates, youand.me – a top dating site with fastest growth in 2009, picfor.me – new popular photo sharing site, dressup.me – games for girls, etcetera. .ME users all over the globe are encouraged to use this material in their promotion, forward it to their colleagues and clients, and reuse it for their advertisements too. Founded in 2008 Brands-and-Jingles is an advertisement agency sponsored by MAKTIG Venture Capital. Its international team in the United Kingdom, the Netherlands and Ukraine creates and develops jingles that intensify brands online as well as in the real world. For more information, visit Brands-and-Jingles.com. Posted in Press-releases. Tagged with .me.